Turkey Neck Soup is pretty much what it says – a soup whose stock is made from turkey necks. It is of course, a soup American in origin (the Turkey also being American). It also derives from the culture of “Less Than Wealthy and Therefore Less Than Wasteful.” The neck of the turkey is actually quite meaty. It’s just tough meat. Tough meat actually has a lot more flavour than tender meat; you just need to cook it longer to get it tender, which brings out even more of the flavour. Which makes it perfect for soup. The turkey was never a staple for native Americans because they were seen as weak. They were only eaten in times of famine. Turkey chicks have a tendency to drown on rainwater. They become curious about the phenomenon above their heads, and look until they drown. “Legend has it” in the 1800’s they cross-bred turkey and chicken into “turken”. 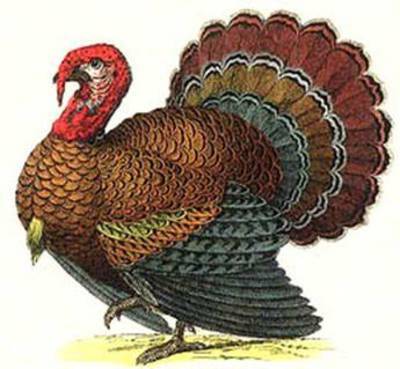 All major documents signed in the founding of the United States used the quill (feather) of a turkey for their signing. 1843 Napoleon E. Guerin received the first U.S. patent for an egg incubator. 1858 Hyman Lipman patented the first pencil with an eraser attached. 1868 The Pullman Palace Car Company introduced the first railroad dining car. 1911 RIP Ellen Swallow Richards, one of the founders of the home economics movement in the U.S.
1945 Eric ‘Slowhand’ Clapton, singer & songwriter was born. A member of the rock groups the Yardbirds and Cream. 1987 ‘Sunflowers’ by Vincent Van Gogh is sold to a Japanese buyer for $39.9 million. There has been some controversy on whether it is possibly a fake. During the 1990s more than 2 dozen Van Gogh’s have been labeled as fakes or copies. Vincent Van Gogh was also born on this day in 1853. Turkey neck soup day ?????!!!! I suppose you can make soup out of turkey like you can with chicken – but it wouldn’t be anything I would pick on a menu. Wouldn’t pick turkey of any kind, sorry US. One of the most boring meats there are, but I can enjoy e turkey and cranberry sandwich.